The Smith Winram Bivouac: pokey inside, but not as pokey as you’d think from the outside. 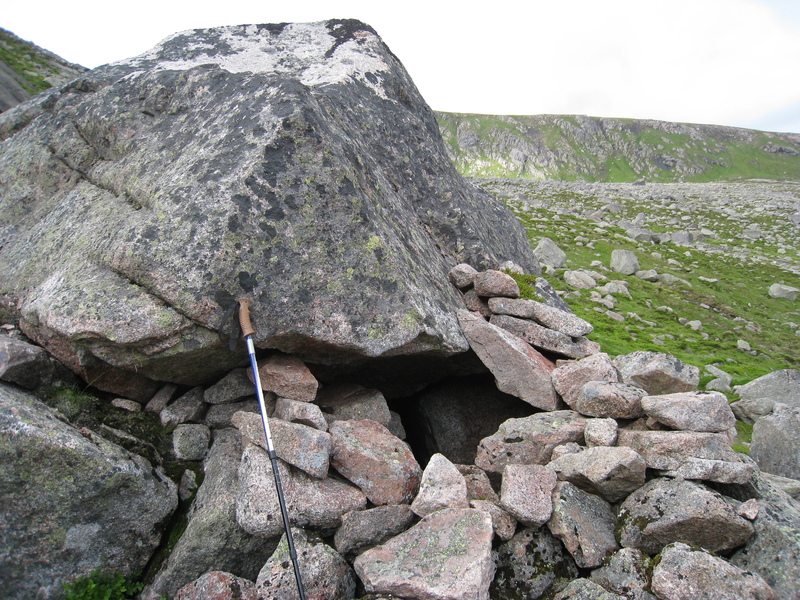 The Smith-Winram Bivouac is a built up cave under a large boulder at the foot of the eastern corries of Beinn a Bhuird. It sits at NO907996 below the Dividing Buttress, which separates Coire an Dubh Lochain and Coire nan Clach. As you approach the boulder is fairly obvious, with an obviously man-made stone wall around the entrance. To get in requires a little care, as you have to lower yourself in, and the walls have the appearance of being a bit unstable – though they have lasted a good few decades now. Inside the accommodation is rather Spartan. The roof is low and if it’s raining you have to avoid the entrance area. There’s reasonable room for two to sleep, and I’ve heard of four sleeping there, but that was said to be a bit of a crush. If, on arriving, the unlikely happens and and people are there already, there are some nice camping spots beside the nearby Dubh Lochan. In fact, if you have a tent, that’s probably a better option anyway. But the Smith-Winram has a great back story and respect for history almost demands at least one night spent there. 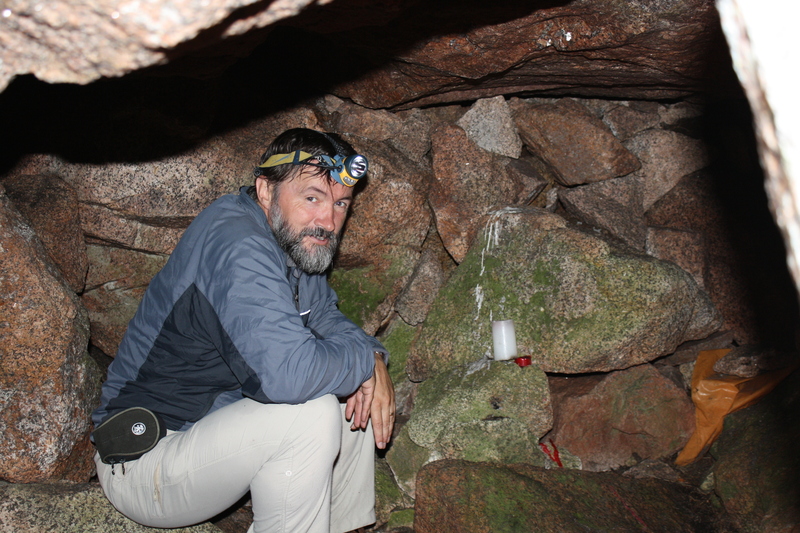 In the latter days of the 1940s Malcolm Smith (who later wrote the first climbing guide to the Cairngorms) and Kenny Winram were discussing an article by the legendary Jock Nimlin in the then current SMC Journal, extolling the virtues of caves and natural shelters. These were days when tents were weighty items, so the idea of a natural gite in the hills was understandably attractive. Smith and Winram – as well as some of their friends – went on a conscious search to find something suitable in their own stamping grounds of the Cairngorms. A number of trips to various corners of the Cairngorms followed, but it wasn’t until they spent a day in the eastern choires of Beinn a Bhuird that they struck gold. The boulder looked promising: gaps around the edges could be built up with rocks. But there was a hitch: a muckle great tooth of rock sticking up from the floor. Time obviously flies when you’re enjoying yourself, because it was three in the morning before they had their tooth of rock extracted and the four men retired to their sleeping bags. They even celebrated in the morning by climbing two new routes. It was a popular doss for a time as many new routes were being climbed in Beinn a Bhuird’s eastern corries, but is probably seldom used now.